Beijing (AFP) – China’s chief central banker said on Friday the country could be more “courageous” in opening its markets, as European and American firms push for greater access to the world’s second largest economy. “Now that we have entered a new stage, we can be more courageous in opening our market to the outside world,” said Zhou Xiaochuan, governor of the People’s Bank of China, during a news conference on the sidelines of the annual rubberstamp parliament in Beijing. China has been considering opening to foreign financial firms since the late 1990s when it was preparing to join the World Trade Organization, Zhou said, blaming the delay on the global financial crisis. But now leaders have taken the first tentative steps, allowing foreign firms to take majority stakes in financial firms operating in China. Last year, Beijing said it would liberalise foreign access within three years, permitting companies to own as much as 51 percent of financial firms — a welcome move for a key US industry as trade tensions stir between the two countries. And on Friday, deputy governor Yi Gang indicated the shareholding restrictions could be loosened or done away with altogether. “This will reduce the discriminatory treatment of foreign-invested institutions, and bring about equal treatment for domestic and foreign investors,” Yi said during the news conference. But analysts question whether foreign firms will be able to make much headway in the country, with Beijing having delayed the move for so long that the opening may do little to threaten the dominance of homegrown financials. Zhou also tore into cryptocurrencies such as Bitcoin but adding that China was still interested in digital units. Last year, China launched one of the world’s strictest crackdowns on cryptocurrency trading and initial coin offerings. At the same time, China’s digital payments ecosystem has developed faster than most of the world with mobile payments dominating everyday transactions throughout urban centres. The PBoC has set up a digital currency research centre, Zhou noted, stressing that such technological developments should be encouraged as long as they serve the real economy. “In the future, traditional forms of paper money and coins may gradually fade away, and some day may not exist at all,” Zhou said. 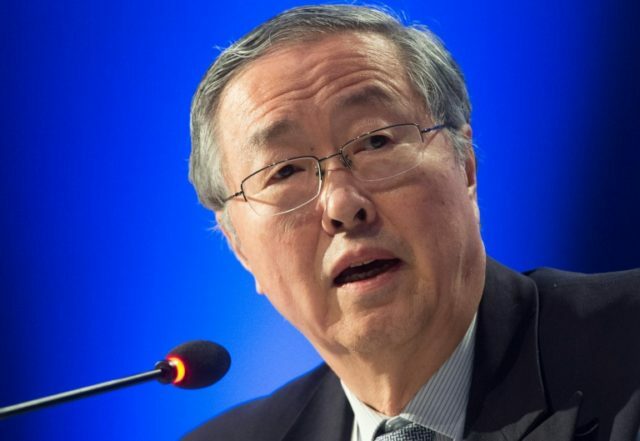 The 70-year-old Zhou is expected to step down from his post this spring, after leading China’s central bank for 15 years.